When I sat down to plan out our menu for Thanksgiving this year, I wanted to include some items that we hadn’t tried before. 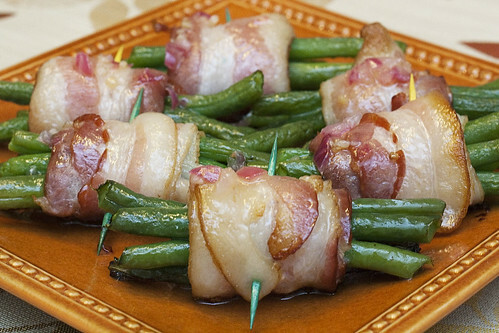 These green bean bundles looked like the perfect side dish. So, I made a few during our pre-Thanksgiving trial run. And boy was I glad I did! The sauce puts them over the top with the salty, sweet flavor. Let me just tell you, the ladies at Our Best Bites know what they’re doing. YUM. Preheat oven to 400 degrees F. Bring a pot of water to boil and add the green beans. Cook for 2-3 minutes, until the green beans start to pop and have turned bright green. Strain and run under cold water until cool. Divide the green beans into eight equal piles. 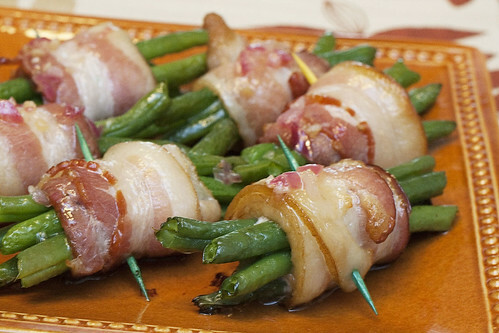 Wrap a slice of bacon around each pile and secure with a toothpick. Bake for 10-15 minutes, until the bacon is crisp. While the bundles are baking, melt the butter over medium-high heat in a small saucepan. Add the onion and garlic and saute until fragrant. Reduce heat and add vinegar, sugar and salt. Remove from heat. Drizzle the bundles with the sauce immediately before serving.